From Goodreads ~ Nearly eighteen, Molly Ayer knows she has one last chance. Just months from "aging out" of the child welfare system and close to being kicked out of her foster home, a community service position helping an elderly woman clean out her home is the only thing keeping her out of juvie and worse. There are two stories in this book ... one is Niamh's which starts in New York City in 1929 and the other is Molly's in Maine which we pick up in 2011 ... and how they intersect in 2011. Nine-year-old Niamh (pronounced "Neev") and her family leave Ireland in 1929 with dreams of a better life in New York City. When they arrive, they discover that it's not much better than what they had in Ireland. A tragedy occurs and Niamh is placed with Children's Aid Society and put on an orphan train, which was a supervised welfare program that transported orphaned and homeless children from crowded American Eastern cities to foster homes located largely in rural areas of the Midwest. We follow Niamh and her experiences in the families she is placed with. Molly is 17 and has been tossed around in foster care for years. She's currently living with a couple who don't really want her (they are just doing it for the money). An impulsive action will land her in juvie unless she does 50 hours of community service. She ends up helping Vivian, a 91-year-old widow, clean out years of stuff (and memories) in her attic. This is the first book I've read by this author and I enjoyed it. I enjoyed the writing style and wanted to keep reading to find out what was going to happen next to Niamh and Molly. It is written in first person perspective from Niamh's point of view and third person perspective from Molly's point of view ... the chapters are labeled so you know the time place and time period. As a head's up, there is some swearing. I liked Niamh and Molly. Though their experiences were separated by decades, they still had a lot in common as foster children. They both went through so much and it made them who they are today. Vivian was cute in her embracing of modern technology. I liked the ending. At the end of the book, there are real pictures of the orphan trains and some of the kids involved. 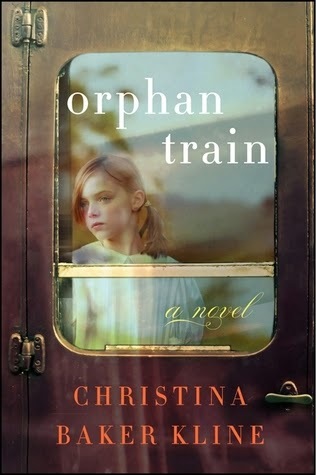 I hadn't heard of the orphan trains before I read this book. Apparently they operated between 1853 and 1929, relocating about 250,000 orphaned, abandoned or homeless children. They typically arrived in a town where local community leaders had assembled interested townspeople. The children would usually be put up on a stage-like podium for viewing and inspection. The townspeople would examine the kids, perhaps feeling muscles and checking teeth, and after a brief interview take the chosen ones home. In Niamh's case, it was similar to slave labour. I felt for Niamh because she was placed in horrible homes but as a young girl with no other options, there wasn't anything she could do about it.